We normally despatch within 1 working day of receipt of your order. Please allow 2-3 working days for your order to arrive within the UK and 5- 10 working days for orders world-wide. We post by Royal Mail and use tracked delivery whenever possible. Any items out of stock will be sent on as soon as they are received back into stock, unless you have requested an alternative or a full refund. Be aware that there are washing instructions on our clothing products which will help you not to shrink or discolour them. We hope that you are delighted with your purchase from Jacks on Trinity. However, if you would like to return any items or your purchase is unsuitable we are happy to provide a refund or exchange assuming that the goods are still in their original packaging and in a fully resaleable condition. To receive a refund you must return the goods to us within 14 days of delivery of the goods. Goods must be returned with your packing slip to the address below. 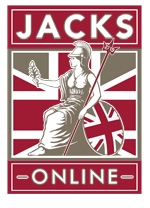 If returning by post, the parcel and its contents are your responsibility until they are received at Jacks on Trinity. The cost of returning the goods is at your expense. This does not affect your statutory rights. We recommend using a registered postal service and retaining the proof of postage as we may require signed proof of delivery. Jacks on Trinity is not responsible for returned goods being lost or damaged in transit. Please note that your original delivery charges will not be refunded. In the unlikely event that your order arrives damaged, please email info@jacksontrinity.co.uk or call 01223 354403 immediately. We will then arrange for a collection of the goods (or arrange for you to return the goods at our cost) and organise a replacement to be sent out to you at the earliest opportunity.